Almost all mammals and birds care for their young to some extent, but most amphibians and reptiles do not. We tend to think of snakes as particularly asocial, and in many cases this is probably true. But, a growing body of evidence contradicts the generalization, made as recently as 1978, that "all reptiles produce precocial offspring without postnatal parental care", and shows that some snakes, in particular, are more caring parents than we typically think. Probably the group of snakes most well-known for parental care are now the vipers, which is somewhat ironic considering the fierce but undeserved reputation of these venomous snakes. Although it was documented as early as 1850, parental care by vipers was not widely known or accepted by the scientific community until the 1990s; like crocodilians, it was assumed that these animals were too vicious to exhibit such caring behavior. When Laurence Klauber, at the time the world's foremost authority on rattlesnakes, wrote in 1956 that "Their propinquity [to aggregate]...does not result from any maternal solicitude; rather it is only because the refuge sought by the mother is also used as a hiding place by the young. ", he was uncharacteristically incorrect; in hindsight, his words now seem almost willfully ignorant. 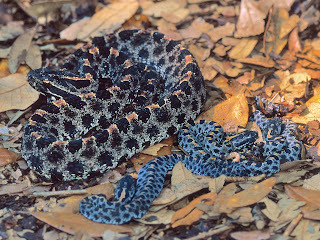 In the 1990s, credible reports of parental care in wild pitvipers began to accumulate, corroborating the many older stories listed by Klauber, and in 2002, a seminal review paper based around two studies using radio-telemetry and DNA proved once and for all that mother rattlesnakes do stay with and care for their young. 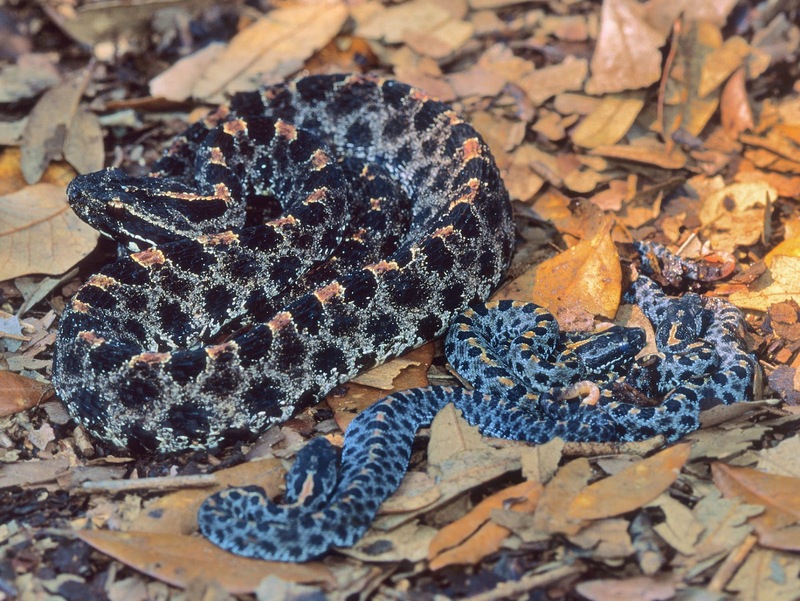 Today, you can read a whole blog about parental care in rattlesnakes, and we think that parental care is widespread (but not ubiquitous) among the ~230 species of pitvipers (aka crotalines or New World vipers). This is particularly remarkable because many of them give birth to live young, which they guard until the young's first shed, even though they may not have eaten for 9-10 months beforehand. It appears that the completion of the first shed cycle is the cue for them to separate, an event which is mediated by the same hormone in snakes as it is in birds and mammals. Because snakes swallow their food whole, the mother can't really feed her offspring, and they forage for themselves after they disperse. Pitvipers are the only snakes known to care for their living young; other snakes with parental care limit themselves to care of their eggs. 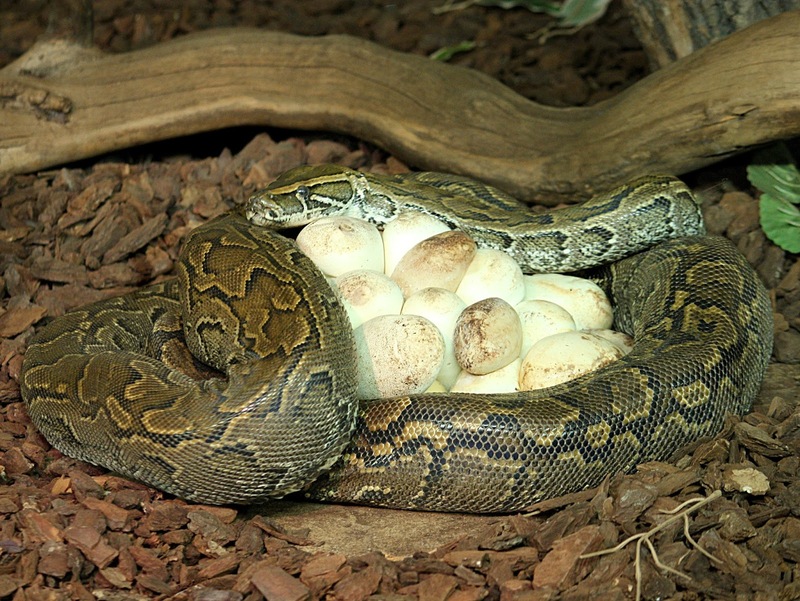 The next most well-known example of parental care in snakes is egg-brooding behavior in pythons, first documented in 1835. All 40 species of pythons lay eggs, and most of them coil tightly around them throughout incubation, forsaking food. As with vipers, early reports of this behavior were dismissed, but by the 1930s observations of pythons in zoos showed that they did indeed brood their eggs. Some species that live in cold climates, such as Indian Pythons (Python molurus) and Carpet Pythons (Morelia spilota), also generate heat using muscle contractions ("shivering"). Measurements taken of brooding Indian Pythons have shown that they can increase the temperature of their clutch by 7-10°F. 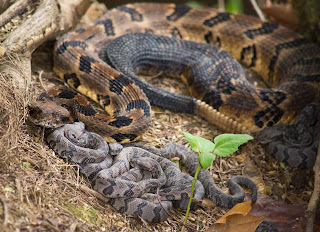 Even though mother pythons may brood for up to 2 months, studies have found that, at normal temperatures, they rarely shiver and lose only about 6% of their body mass, suggesting that the costs of brooding are relatively small compared to the benefits, which also include reduced water loss by the eggs and hatchlings that develop faster and are larger and more active. The brooding instinct in mother pythons is very strong—lab experiments have shown that they will brood the eggs of other pythons just as readily as they will brood their own, and they will even brood rocks that are the same size as their eggs (a behavior reminiscent of the well-known fixed-action pattern of egg-retrieval behavior in graylag geese). Today, pythons are frequently used as models to study female reproductive behavior and life-history trade-offs. That female King Cobras (Ophiophagus hannah) use their coils to build a nest of sticks and bamboo leaves and guard their eggs for two to three months has been known at least since 18921. Detailed observation of nest-building and attendance were made in captivity at the Bronx Zoo from 1953-1956, and wild King Cobra nests were surveyed and detailed observations made in 19692. 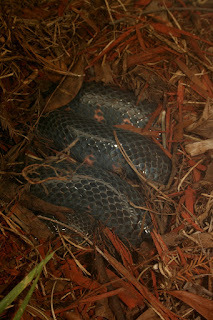 King Cobra nests are the largest and most complex of any snake's, measuring up to four feet in diameter and rising to a similar height, with an internal chamber for the 20-50 eggs and sometimes a second one above for the snake, which abandons the nest just before the eggs hatch. The female must select her nesting material and bring it to the nest site, because the species of bamboo that are most commonly used in building the nest are not the most abundant species in the surrounding area. There are also some anecdotal reports that male King Cobras will guard the nest and/or the female. Some sources suggest that female King Cobras are more aggressive towards humans when they are guarding their nests, but most suggest that their behavior is no different than at any other time. 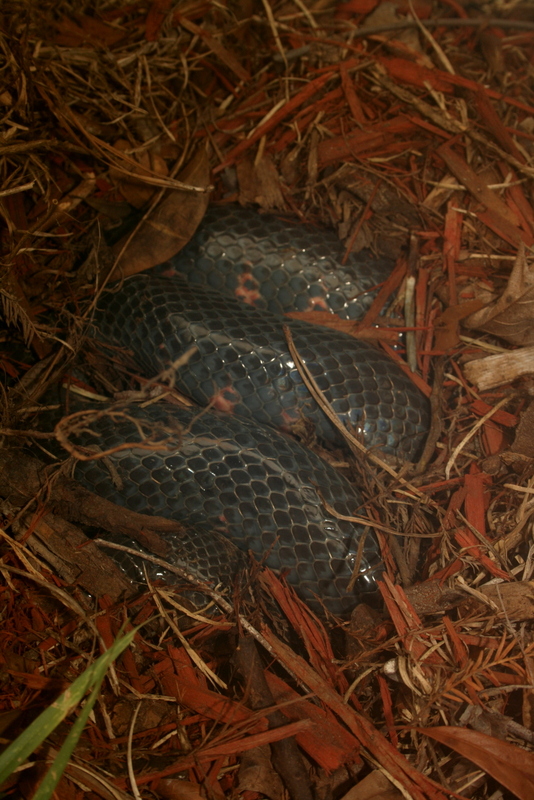 Maternal attendance or guarding of clutches of eggs is widespread in snakes, but observations in the wild are still fairly uncommon, mostly due to the difficulty of locating nesting sites. There are several excellent reviews of this topic, including those written by Rick Shine (1988), Carl Gans (1996), Louis Somma (2003), and Zach Stahlschmidt and Dale DeNardo (2011). Other species of true cobras (King Cobras are more closely related to mambas), such as Shield-nosed Cobras (Aspidelaps scutatus) and some Asian cobras (genus Naja). Unlike King Cobras, they do not build nests but some may dig holes or enlarge existing holes. Other elapids, including kraits (genus Bungarus), coralsnakes (genus Micrurus), and possibly some sea snakes (genus Laticauda) and terrestrial Australian elapids (genera Demansia, Pseudechis, and Pseudonaja). Mud and Rainbow Snakes (genus Farancia), which spend most of their lives in water but lay and brood their eggs on land. Malagasy Hog-nosed Snakes (Leioheterodon madagascarensis), which may leave their nest and return several times over a period of a few months. Rhombic Skaapstekers (Psammophylax rhombeatus), which guard their eggs under rocks in southern African grasslands, and possibly other species of Psammophylax as well. New Mexico Blindsnakes (Rena dissecta), which have been found with their eggs in small colonies in sandstone in Kansas. There are hints of parental care in other blindsnakes as well. It's worth noting that, unlike the case with pythons, survival or physiological benefits to the eggs have not been documented in any of these cases. In addition, there are numerous anecdotal reports of egg attendance in other snakes, many of which are based on hearsay and are not backed up by data, photographs, or even descriptions. So, expect this list to grow, but keep in mind that parental care in snakes is still, and will probably always be, the exception rather than the rule. have only one segment and cannot yet make sound. Physical concealment, especially of the eggs, which are less well-camouflaged than the adults. Deterrence of predators, which may recognize an adult viper as a threat but not an egg or a juvenile. Active defense from predators, using venom or the threat thereof. This may be especially important prior to the first shed of the young, since they would probably suffer their heaviest mortality during this stage because of their small size, inexperience, hampered eyesight and pit organ sensitivity, and, in rattlesnakes, their inability to use their rattle. Socially-facilitated retreat from predators, in which the parent helps the young escape an attack by physically moving them, showing them what to do, or distracting the predator. These may seem like surprisingly sophisticated behaviors for snakes, but several observations of mother snakes and their young support this idea, and we are learning that many snakes have subtle but complex social lives and communication abilities that have long been underappreciated. Antipredator benefits of parental care in snakes may vary geographically or in other ways, because some species of pitvipers do not seem to change their defensive behavior when they are guarding their young, but others are more defensive, and still others are less defensive but more distracting. 2. Litters or clutches of several species of young snakes, including some rattlesnakes, aggregate together, without their mothers, in order to conserve water or heat—which, if they were mammals, we would call snuggling. Experiments have shown that they prefer to snuggle—sorry, I mean aggregate—inside shelters that contain their own scent cues, and that snuggling kept them warm, which helped them slither to shelter faster. No one has tested whether young pitvipers that snuggle with their mothers have higher body temperatures or lower rates of evaporative water loss than those snuggling with one another, but physics suggests that they would, since larger animals have a lower surface-area-to-volume ratio and thus lose heat and water more slowly. The presence of the mother may also offset the increased visibility or olfactory conspicuousness to predators of a bunch of aggregated young snakes. 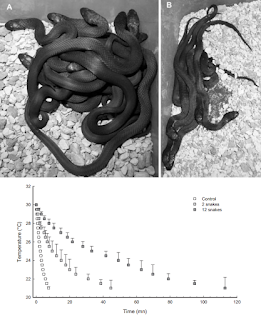 If this is the primary benefit, it is easy to see how maternal attendance of eggs could evolve into maternal attendance of the young, because we think that live birth has evolved many times in snakes, and parental care may have evolved and been lost as many as six and ten times, respectively, in vipers. It's probable that we will continue to fill in the gaps in our knowledge. 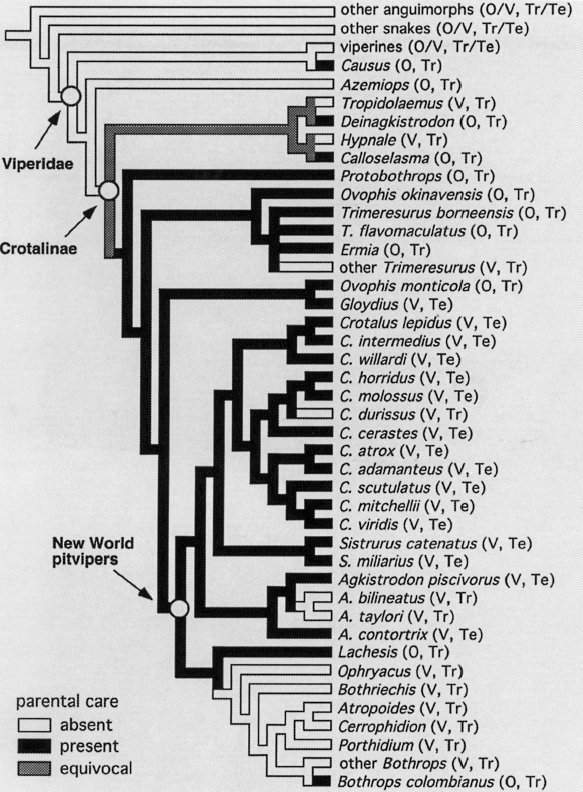 For example, perhaps we're overlooking the behavior in some poorly-studied vipers, as we did in North American pitvipers for over a century. 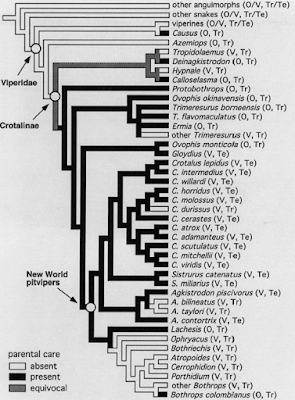 Viper family tree showing the evolution of parental care. 3. The week or so of parental care may represent an imprinting period for the young snakes to learn the scent of their mother and of one another, similar to the time a young sea turtle spends imprinting on its natal beach or a young salmon on its natal stream. This would be especially important for snakes in cold climates because they use each others' scent trails to locate hibernation sites. Although there is no direct evidence for the third hypothesis, it is suggestive that, at least in the Americas, temperate pitvipers stay with their young, but live-bearing tropical pitvipers, which do not need to hibernate, do not3. Other explanations include that memories of their siblings' scents help young snakes avoid inbreeding later in life, or that they promote other social behaviors, such as communal basking. Some new data suggest that the adult behavior of pitvipers differs when they are deprived of a maternal attendance period. Tall tales about snakes abound, and initially social behavior ranked among them (there are still false tales about parental behavior in snakes, such as the idea that they swallow their young). Parental care in vipers may just be the tip of their social iceberg. Research over the last decade has shown that vipers make use of chemical information left behind by other vipers when they choose their foraging sites, like a dog sniffing a fire hydrant. This kind of cryptic sociality in snakes can lead to things like inheritance of birthing rookeries, nesting sites, and hibernation sites over many generations. Some research even suggests that pair-bonding might happen between male and female copperheads. Some lizards build multi-generational homes; might we one day discover snakes doing the same? If we do, my money is on vipers. Thanks to my parents, for indulging my interest in snakes and encouraging me to pursue a career studying them, and to Jim Williams, Peter May, J. Lanki, and Matt Nordgren for the use of their photos. Bates, M. F. 1985. Notes on egg clutches in Lamprophis inornatus and Psammophylax rhombeatus rhombeatus. The Journal of the Herpetological Association of Africa 31:21-22. Oliver, J. A. 1956. Reproduction in the king cobra, Ophiophagus hannah Cantor. Zoologica 41:145-152. Somma, L. A. 2003a. Parental Behavior in Lepidosaurian and Testudinian Reptiles: A Literature Survey. Krieger Publishing Company, Malabar, Florida, USA. Whitaker, N., P. G. Shankar, and R. Whitaker. 2013. 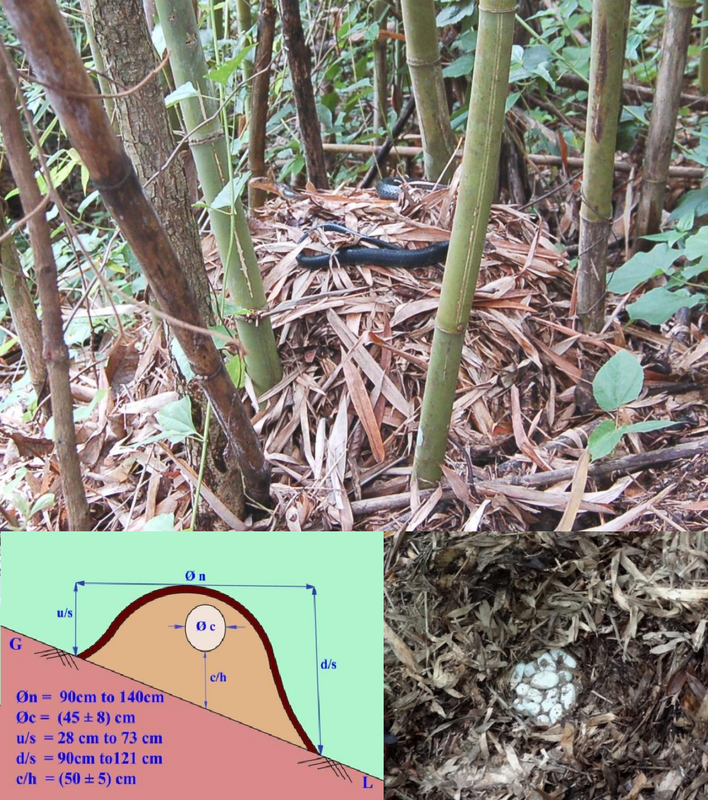 Nesting ecology of the King Cobra (Ophiophagus hannah) in India. Hamadryad 36:101-107.